Been working non stop today. Feels like I have little projects and jobs coming out of my ears, my to-do list is slowly getting ticked off though! Good Job I'm a Taurus and a ~workaholic~ or I probably would have lost the will to live. Keeping organized and top of things while freelancing has been a BIG learning curve! I've always been focused, but its just weird not having someone infront of you saying "do this this and this" its more like me shouting at myself saying "YOU MUST DO THIS NOW"! Like a Boss. I'd love to be able to pull off a bow tie :( I just always end up looking geeky! Oh, I really like the jumper! And it's from Primark ?! Love the skirt, its very unique! And the ring is to die for! love it. i really love your hear! Ahaha, I can find it really hard to motivate myself sometimes. Damn, I want that skirt so much! Also - I've had my eye on that watch for aggggessss but am determined to find one exactly like it but with a leather strap... thinking I should just give up and go to Swatch! 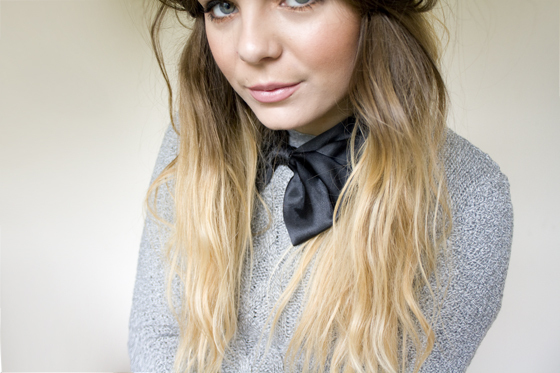 Love your bow, very silky and chic. Love the skirt and your hair <3 gorgeous. I nabbed that skirt aswell - sometimes Primark just rules! 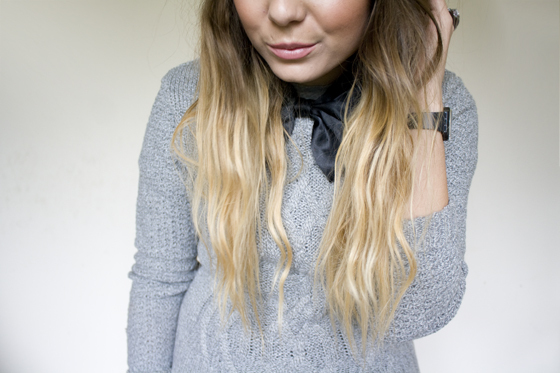 Love the bow with it aswell! LOVE this look. The necktie is so cute! I totally agree about freelancing too - finding the motivation to work when you could quite easily just... not... is hard! The bow tie with the pleated skirt emulates such a cute, school girl vibe. And adore your french manicure! Awesome skirt, is that leather? Different take on the original pleated school girl skirt. awww cute I LOVE the whole entire outfit! that skirt is wicked! and your hair, to die forrr! The bowtie makes the outfit. that beautiful skirt is from PRIMARK? HOW CAN EVERYONE FIND NICE THINGS IN PRIMARK EXCEPT ME!!!!!!! I like your sense of style so much! And i love your hair, you are doing an amazing job, go on! a lovely outfit, simple yet striking! the bowtie is so cute, & your hair looks gorgeous! I have side projects coming out of my ears as well. Every night I come home from work and then its a quick tea (esp if its at 9pm) then I start/continue a side project. I've managed to check off a couple though :). I love the primark jumper as well. I'm not really a jumper person but after buying one from my work, I think i'm in love :). Lovin the bow:) Such a cute outfit! I love this jumper, I couldn't find anything nice in there the other day everything had disappeared within a hour! love this entire outfit, you look lovely! love the styling, your nails are so perfect! I love your sweater and those nails are so lovely. I have the skirt but planned to take it back as i just can't find an outfit for it, you've inspired me to give it another go! Did you do your nails yourself? They are perfect! I absolutely adore this whole outfit!! The bow tie is uber cool! Nice outfit. I like the skirt. You're an advertising book, you are. Now I'm itchy to get to Primark ASAP to get that jumper... & secretly hoping that there are a myriad of other colours too! Love the little neck tie, is it leather? 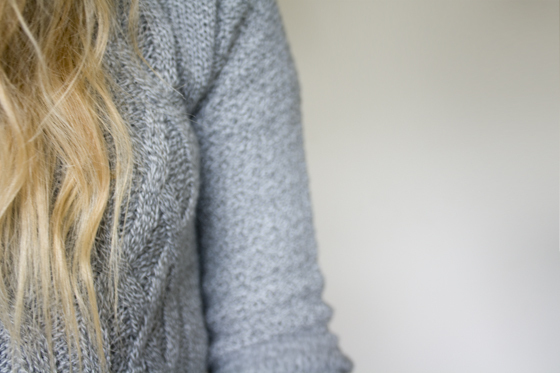 Gorgeous, love the knit and your nails are so pretty. always feels good to get work done :D i'm on my year abroad in france and they don't minitor lecture/seminar attendance here but i've been going to all of them! 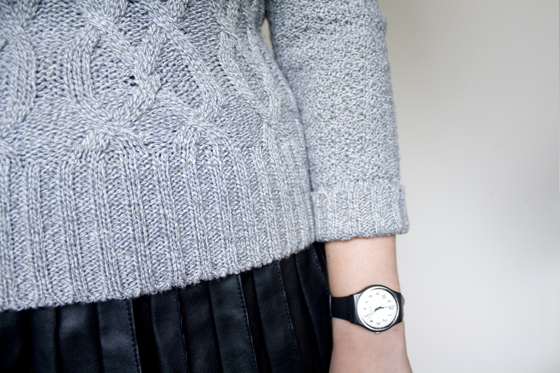 lovely skirt and jumper - i swear i miss primark so much, it's ridiculous! Gosh, the hair is so fab ! 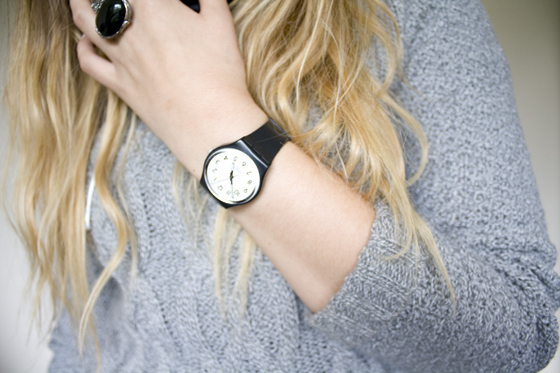 You look lovely - I love your watch and skirt. I loove your hair and style ! Oooh I just bought that the other day in the dark red colour... lovely jumper. I think I might try the little bow addition too with mine! this so sweet, so cosy, that jumper is exactly what I'm looking for right now!